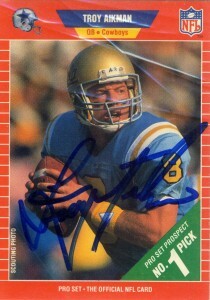 Troy Aikman was the #1 pick of the phenomenal 1989 NFL Draft. His career started badly enough, with a 0-11 record as a starter in his first season. He’d have to wait till 1990 for his first win as a starting quarterback. (Steve Walsh would also be drafted in 1989 to compete against Aikman, and won the team’s only game against the Washington Redskins that season.) The team slowly grew under Aikman’s stead where Dallas finally reached the playoffs in 1991, which would coincide with the beginning of 6 consecutive ProBowl appearances. He’d earn the 1992 NFL Super Bowl MVP, and in 1997 the Walter Payton Man of the Year Award. A good manager and custodian, who learned not to turn the ball over- Aikman was probably one of the last in a line of quarterbacks who were allowed time (3 seasons or more) to grow into their job. (One could wonder about David Carr, for example, if he could’ve ever turned the corner without the bright glare of the media, fantasy football or armchair Madden experts screaming on the internet about passing mechanics even though they never played themselves.) Troy over a 12 year career only started a full season 3 times, (which in this day and age would get you labeled as ‘injury prone’) and finished with over 20 touchdowns, (23) once in his career. He’d also never throw for over 3,500 yards. Despite his purely average 81.6 quarterback rating, Aikman was a winner, with his 90 wins being the most during the 1990s among starting quarterbacks. He also was 11-4 in the playoffs. Injuries would eventually begin to take their toll on him as he had 10 career concussions. Waived after the 2000 season, and unable to find a team, he retired after brief flirtations with the Miami Dolphins. Aikman since football has become quite a good commentator, broadcasting for FOX and is part of the network’s premier crew. In 2005 he was inducted into the Dallas Cowboys Ring of Honor, and into the Hall of Fame in 2006. He also was inducted into the College Hall of Fame in 2008 and in 2010 also started doing commercials for Rent-A-Center. 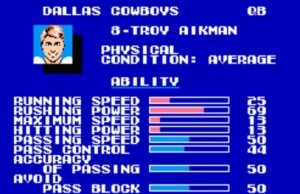 Troy Aikman was a difficult signature to acquire at training camp. I was only able to get him once, – the first day of the second training camp, and never got him again. (The artifact lines across the card are from the plastic sleeve and are not a representation of the condition of the card.) Like Emmitt Smith, Troy wasn’t a widespread signer and this didn’t really endear him to me, considering I went to training camp solid for 4 seasons. I guess it was hit or miss. I met kids who got 4 or 5 cards signed, and he was kind enough to sign quite a few for the handicapped, but I guess he thought I was a seller since I was there all the time. Nonetheless one does suffice, and this card was probably my favorite of his. As of late it has come to my attention that Aikman is charging now for his autograph on cards and helmets with reports going anywhere from $100-200 through the mail.